Recently I have encountered a problem with the Windows Update client on a server with Forefront Threat Management Gateway (TMG) 2010 installed. 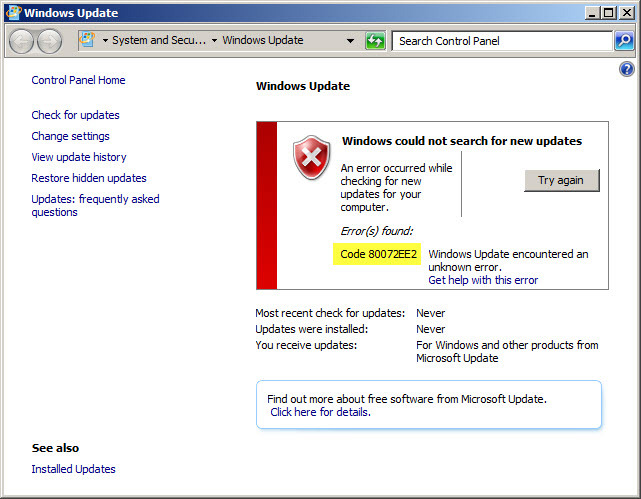 The Error is: Windows could not search for new updates with error code: 80072EE2. When this occurs, Malware Inspection and Network Inspection Systems signature updates are received without issue. If you need to configure Windows Update on the TMG firewall to work with WSUS, read this blog post on the Forefront TMG product team blog. Next Next post: DPM DCOM was unable to communicate with the computer <servername> using any of the configured protocols or A DPM agent failed to communicate with the DPM service on <servername> because of a communication error.